Let's so straight to the point. How do you get the Housewife Hina and then receive Soba from her? Lingerie Seller gives Hostel Promotion. Singer gives Add Spring Water. TV Personality gives Free Vouchers. Exec. Assistant does give you a plan but it does not help getting Hina. 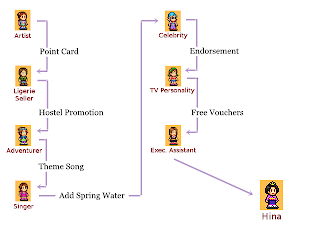 Therefore, to quickly get Hina, the best way is to run those plans as soon as you can. Once you run the plan, the next housewife starts visiting. 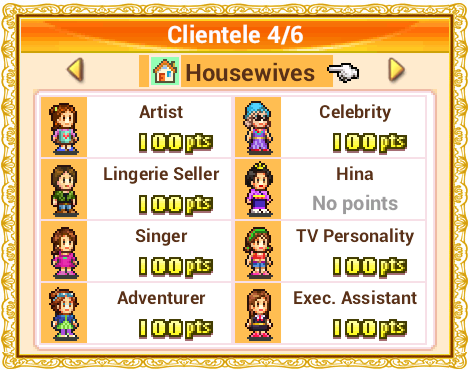 If the plan is not done by the time that particular housewife reaches 100 points, the next housewife will start coming anyway. Most people have trouble here. I was suggested serving Crab Fried Rice last time but it took ages so I decided to server all kinds of Rice dishes and finally got her. This time, I decided to try just plain Rice ( 4 Stars, Brain up 73, Aroma 90, Appearance 22, the rest 100 ). Hina came in, tried the Rice and gave me the Soba straight away. I've also noticed, if she followed her friends in, even if she tried the Rice, she wouldn't say a word. That is why sometimes we need to wait a bit. I was just curious so I reloaded the game and tried serving Crab Fried Rice. ( 5 Stars ) Five months passed and she had tried the dish many times but she just kept quiet. So I am wondering, since Crab Fried Rice worked for some people, maybe it's a little random each playthough? I hope this helps people getting the Soba. If you have any questions, please leave a comment and we will try and work it out together. I have both seafood soup and crab fried rice in all my 3 restaurants. And Hina comes a lot of times and eat the crab fried rice didn't give me soba. I think I should try your way. What are some of the ways you can get Exec. Assistant to 100 points? I have already tried putting up lots of chairs and tables that appeal to housewives, such as the Japanese set and the Western set. How did you do it? The only way to gain customer points is when they come to the stores - eat and pay for it. If they come in with other friends and others pay for it, then they don't give any points. It's just a matter of time really. Hope that helps. :D Have fun! I made my rice as good as I could but still Hina would not try it even though she was visiting regularly. So I changed one of the menus so that it served ONLY rice (every single selection was rice!) and straight away, she ate the rice and gave me soba! Thank you for all your information :) I hope this helps.